Search Our Site! Type what you are looking for in box below and then hit "Enter". BackyardCityPools.com is proud to offer Blue Wave and Nava premium stabilized chlorine featuring U.V. protection to shield the chemicals from the sun's harsh rays. These are the best chlorine brands we have come across, and they are manufactured using only the highest quality, EPA-approved chlorine. 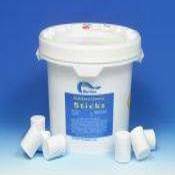 Use in your floater or automatic chlorinator, this chlorine has been proven to stop bacteria and algae growth in their tracks. Strict quality-controlled manufacturing process ensures the optimum hardness of each chlorine stick. This keeps sticks from dissolving too rapidly and ensures proper chlorine dosages 24 hours a day. You will find that these chlorine sticks dissolve completely with no residue. It's the best you can buy! Available in 10 lbs, 25 lbs, or 50 lbs tubs. Got a question, send us an email! Or call us Toll Free: 888-253-9736! Images Disclaimer: We have made a concerted effort to provide images that accurately represent the actual color, style, size & shape of each product. However, due to all the possible variants, including but not limited to: light source, monitor quality or settings, etc. ; we can not guarantee that these images represent the actual colors of the product. Returns due to color discrepancies will be considered a return of a non-defective item as detailed in our "Legal / Return Policies" link in footer below. © Copyright 2001- by BackyardCityPools.com. All Rights Reserved.